In today’s episode of PianoTV, we’ll be talking about the history of Franz Schubert. This video has been requested a lot lately, as well as analyses of his works, so I figured today’s as good a day as any. In this blog post on the history of Franz Schubert, we’ll talk about Franz Schubert’s life, his very early death, and the huge amount of compositions he left behind despite his age. Schubert was born in 1797 and died in 1828. This makes him a transitional composer from Classical music to Romantic music (much like Beethoven in his later years). He was born in Vienna, to a father who was a teacher, and a mother who was a housemaid. He went to his dad’s school, and was given music lessons by his dad and his older brothers. It was actually Salieri who first took notice of Schubert’s talent as a vocalist. If you’ve ever seen the movie Amadeus – which you should! 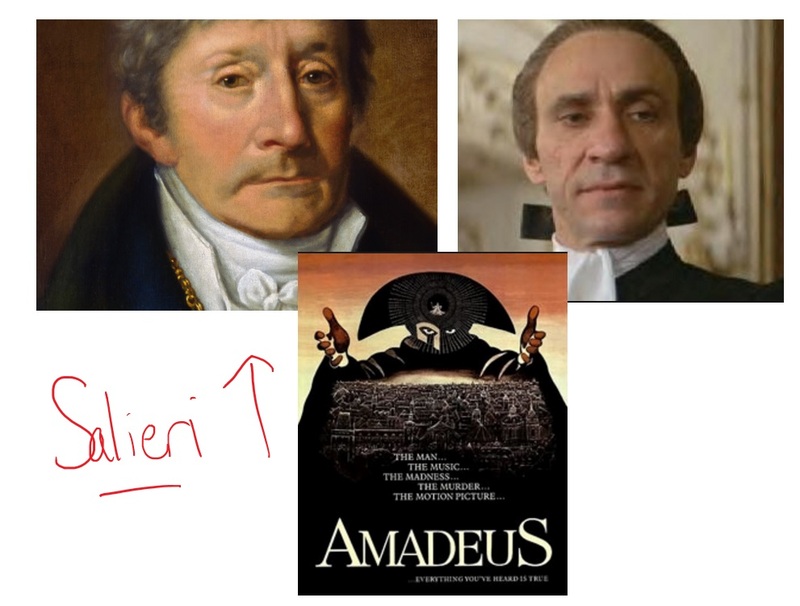 – Salieri is Mozart’s rival in the movie. Schubert was accepted into the Stadtkonvickt school at age 11 with a vocal scholarship. Once Schubert’s talent became even more evident in his compositions, Salieri decided to personally instruct him. Schubert was also allowed to lead the Stadtkonvickt symphony. 1814 was a big year for Schubert. When Schubert was 17 years old, he came back to his father’s school as a teacher – but he hated the job. He wasn’t really cut out for the working world, at least not in the traditional sense. He also fell in love with a singer named Therese, and wrote some songs for her. He wanted to marry her, but there was actually a law at the time that the man had to prove he had the income to support a family. Not to mention that he wasn’t exactly the most desirable of companions, but we’ll talk more about his appearance in a bit. So in 1816, when he decided to quit his father’s school, but failed to get the post of kappelmeister at Laibach, he decided to move in with a friend, Schober, and his mom. At first he half-heartedly attempted to make an income by teaching music lessons and not be a bum at his friend’s house. But that fell by the wayside as he started composing more and more. At this point he had already composed hundreds of songs – vocal works, symphonies and the like – so clearly we knew where his passion was, even as a teenager. Schubert’s roommate and friend, Schober, introduced him to a guy named Johann Vogl, who was a famous baritone much older than Schubert. They went on to become good friends, and Schubert wrote many pieces for him. Since Vogl was so influential, he played a big role in bringing Schubert into the Viennese music scene, and giving him important contacts. Schubert had a great many important friends, and these friends were responsible for keeping his music alive when he died. Performances of Schubert’s songs were often performed at private gatherings, typically with Schubert himself at the piano, and Vogl singing. They even had a name for these little gatherings – Schubertiades. Around this time, Schubert didn’t have much luck with publishing despite his enormous output. He was having some luck with performances, like the 1821 performance of Der Erlkonig by Vogl. But his opera game was way off. He had written two operas, and many other stage shows, that bombed for all kinds of reasons, like censorship and drama. Even when Schubert was trying to make something work on stage, he still managed to compose huge amounts of music like a champ. By the time 1825 rolled around, when Schubert was 28, his bad luck had transformed. He was having publishing success, he was actually making a little money, and he even did a small Austrian tour (he didn’t travel much). For the last few years of his life, he continued to write lots of music (surprise, surprise). He gave the only public concert of his own works (all of his other personal performances were in more private settings). We can learn a lot about Schubert based on his music, because he didn’t have an exciting outer life, nor did he care to. His inner life is where we glimpse brilliance, and can get a sense of the man he really was. But we’ll talk about that after discussing his death. In 1823, the syphilis symptoms started – more on how he contracted that in a bit. However, he probably didn’t die of syphilis – official records state that he died in 1828 of typhoid fever. Near the end of his life, Schubert knew he was approaching death, and expressed his fears to his friends (there are plenty of death themes in his music as well). In the hours leading up to his death, sick and delirious, he grabbed his doctor and said very seriously, “here, here is my death”. So even though he probably died of typhoid fever, he was probably also going through symptoms of mercury poisoning, which was the common treatment for syphilis at the time. Regardless of the cause of death, he died relatively swiftly. His final illness only lasted a couple of weeks, and he had only been seeing a doctor for a year or so. Many composers, like Beethoven, spend decades of slow degradation, so perhaps it was a small mercy. Schubert was buried next to Beethoven, as per his request, in Vienna. Schubert’s early death at age 31 was a shock to his friends, but at least he had an enormous composition output (over 1,500 compositions). Schubert never really achieved fame in his lifetime. He had plenty of influential friends who considered him a genius, but he never really “made it” in the public world like some of his contemporaries. Maybe he was a composer before his time. It was the romantic composers like Liszt who revived Schubert’s music and gave it momentum, solidifying him as one of the greatest composers of all time. Liszt considered Schubert “the most poetic musician who ever lived”. He made arrangements for many of Schubert’s songs, and spread them around. Dvorak and Berlioz loved and acknowledged his symphonies. Mendelssohn, Schumann and Brahms were other Romantic composers who championed his works. 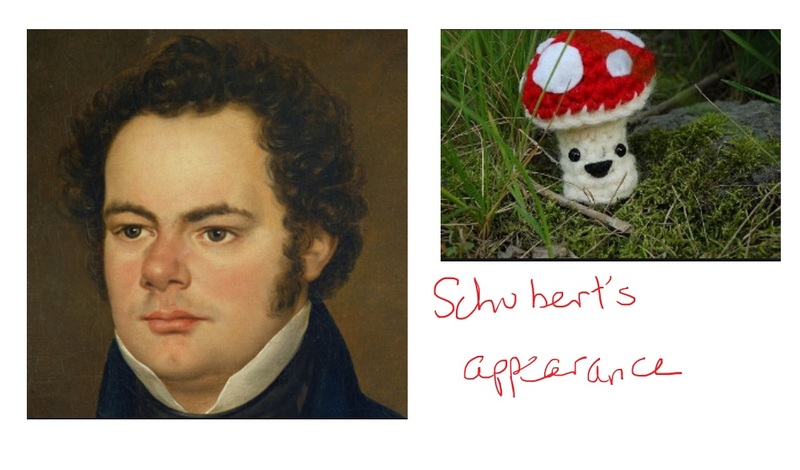 Schubert was not a beautiful man. In fact, his friends called him “Schwammerl”, which translates roughly to “little mushroom”, because he was so small and stocky. He wasn’t even 5 feet tall. Aside from his very short height, he was also near-sighted with glasses, and he was quite shy as well. Schubert’s personality probably played a big part in his relative obscurity in his lifetime. Schubert wasn’t a self-promoter, and he wasn’t a people person. Therefore, word of his talent only spread because influential people knew about him. Because of this single-minded focus, he did indeed write a huge amount of music, but didn’t spend any time promoting himself. Not to mention he wasn’t the least bit charismatic. He didn’t care about wealth, and he didn’t care about fame. He only wanted to write music. Ultimately, Schubert was an unhappy, unsocial man on the outside, but his inner world, the world of his music, is beautiful and interesting and grand. You really can’t judge a book by its cover. In the next video, we’ll go more in-depth into Schubert’s compositions and famous works, and his musical style. I hope you enjoyed this video/blog post on the history of Franz Schubert, and stay tuned for next time!